What’s This Hole in My Dog’s Elbow? 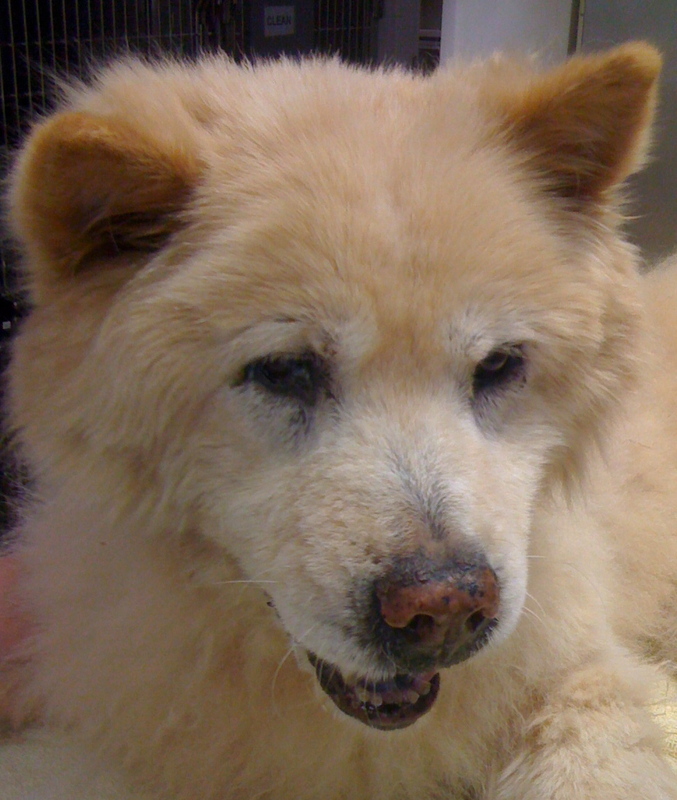 A stately, stiff-legged, arthritic 14-year-old golden-colored Chow Chow stared at Doc Truli and wagged the tip of his medium-length, slightly curled tail. Bear had his doubts about a visit to the vet’s. “Bear, honey, go say hi to the Doctor,” said Bear’s well-meaning mom. Bear stood in the open exam room doorway, his shoulders in the room, his hind end strategically positioned in the hallway leading back to the truck. Bear was hoping he was getting a dog cookie and that would be the end of it. “You want a cookie, Bear?” said Doc Truli. Doc Truli held out a cookie. “Oh, a cookie,” Bear walked over, took the cookie with his front incisors only, careful not to touch the veterinarian with his delicate lips. bear threw the cookie down on the tile floor in front of himself and looked up at the Doc to see what her next move would be. “He’s shy,” said Bear’s mom. No, he’s smart, thought Doc Truli. Smart dogs are much harder to examine than silly, happy dogs. “Okay Bear, we’re going to have you stand still while I examine you and especially take a look at that elbow,” said Doc Truli, hoping to recruit Bear through voluntary cooperation. A trapped, cornered Chow Chow is impossible to open negotiations with, Bear and the Doc needed to be on good terms from the start. Hence, the cookie bribe. 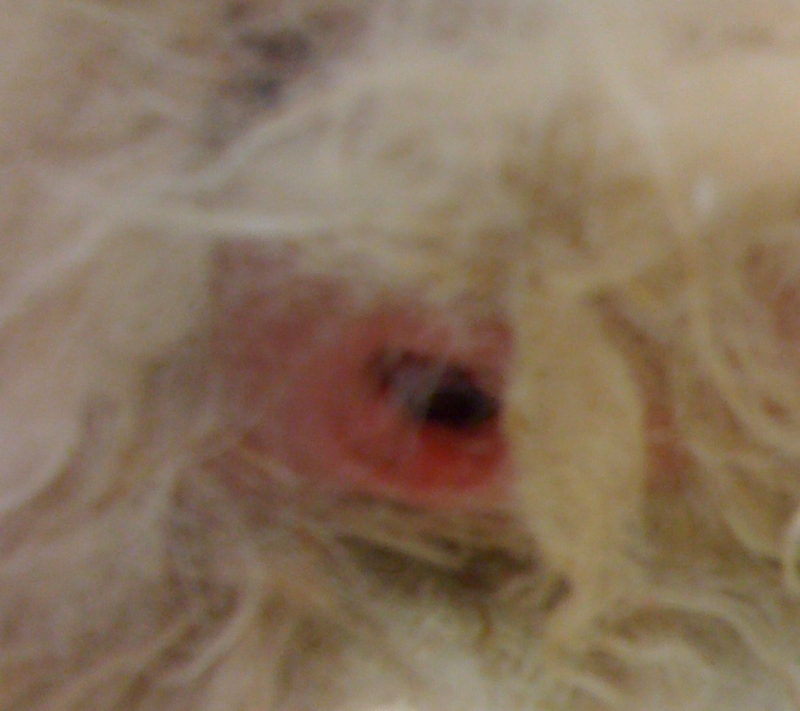 The lump was a hygroma (pronounced high grow ma). It is a fleshy rounded growth of the connective tissues under the skin that the body grows to protect the point of a bone from irritation and wear on a hard surface. It is not filled with liquid that can be drained, because it is not a pouch. It is like a callous, in that the body naturally grows a hygroma to protect an irritated point like the side of the elbow, the side of a knee, a hip-joint, or sometimes, the center of the sternum where it hits the floor (like in a dachshund or a greyhound). If your dog has a hygroma, then the solution is to get him or her to lie down on soft surfaces, not hard floors. Over time, if the surface is cushioned, the hygroma is not needed and the body will re-absorb it. Now, most dogs that get these hygromas like to lie on cement or tile floors. Sometimes Doc has seen them on police dogs that lie on a thin matt in the back of the squad car (if they are given a thicker matt, they eat it!) It can be a challenge to get a dog who likes a cool, smooth hard surface to lie somewhere else for the sake of his or her elbow. But you need to work at it, because the dilemma will only get worse. Left untreated and unprotected, and sometimes even despite our best efforts, an elbow or other hygroma, may break open. After all, the thickened tissue that filled the hygroma is weaker than normal body tissue, and constant pressure can cause it to erode away like a bed sore. Eventually, the white bone underneath is showing. Some of these open areas get nasty infections, even osteomyelitis (infection of the bone itself), which are painful and life-threatening infections. Home-made leggings can protect the elbows. 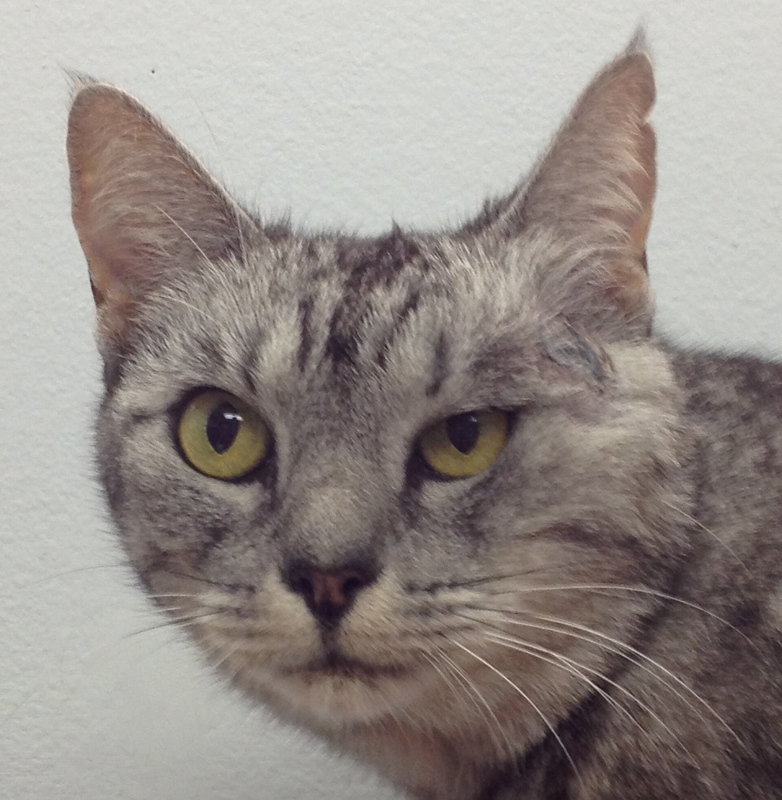 Ask your Veterinarian about Vitamin E to stimulate healing. 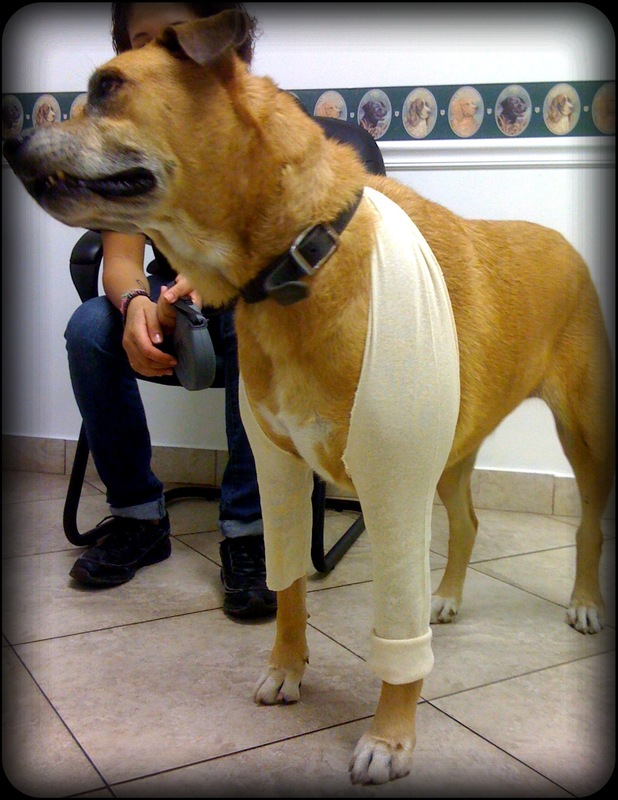 There are also wound healing products originally designed for horses which can enhance the healing process in dogs. Doc Truli has used some of them to good effect. 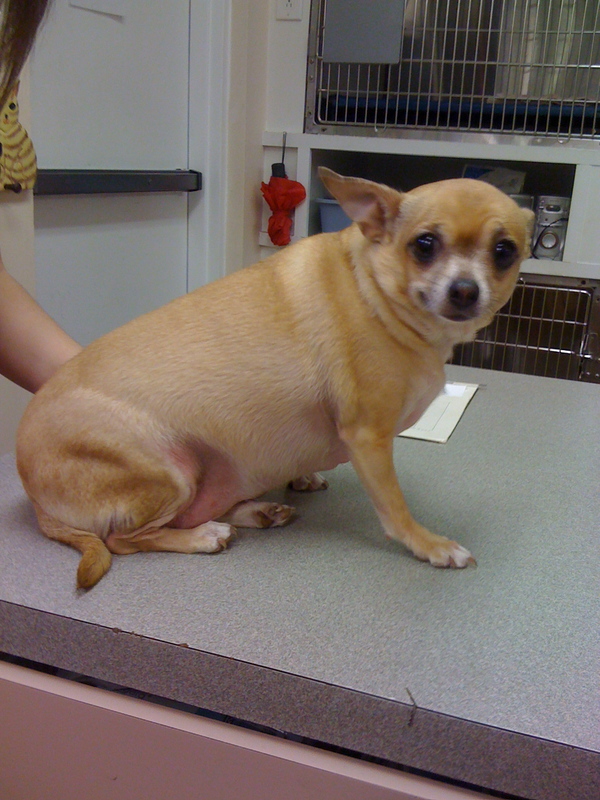 There are many available in different formulas in different countries, so consult with your veterinarian about this. The Class Four Therapeutic Lasers can help enhance the healing process of an open wound. Obviously, antibiotics will probably be prescribed. 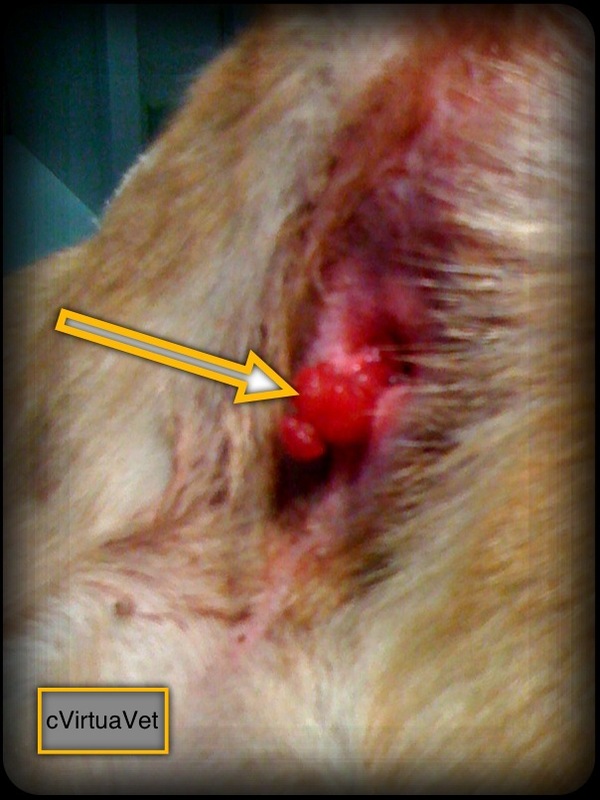 Surgery rarely cures these sores because the dog continues to lay on the spot. Surgery can be used to take away dead tissue to promote new healing. Sometimes, a flap can be made to cover the area or bring the area to a smaller, closer position so the body has less to heal. Many times, multiple surgeries have to be performed before the hole closes over. 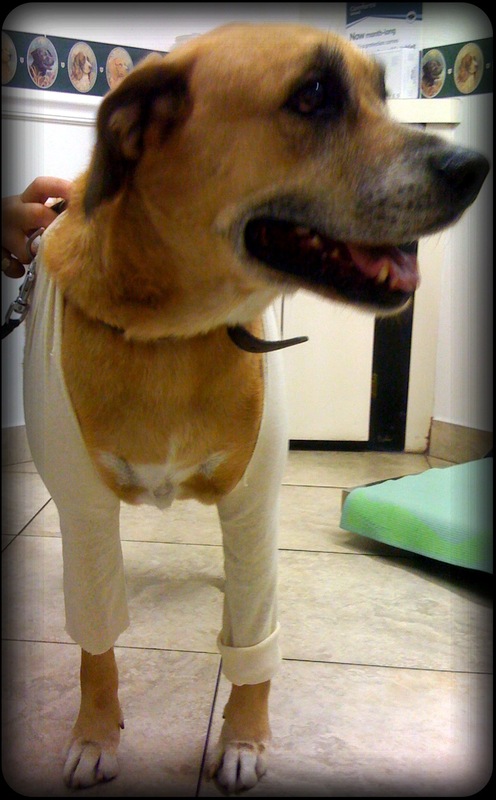 Many dogs heal 90-95% of the way, but the last inch or so never fully closes. It is not ideal, but if it does not hurt and does not get infected, it may be an acceptable conclusion to the whole debacle. Bear’s mom had no idea how the hole got on his elbow. When Doc Truli let her know it came from laying on hard surfaces, she immediately went out and bought 3 orthopedic dog beds. Which Bear loved! He took his vitamins and his antibiotics and wore leggings for a few weeks. 6 months later, at his recheck, his elbow was healed. bear still would not eat a cookie in front of the doctor, however! My dog Bella has a hole in her stomach and it looks infected and it smells horrible. I don’t know what it is and I need help asap, this is scaring me . 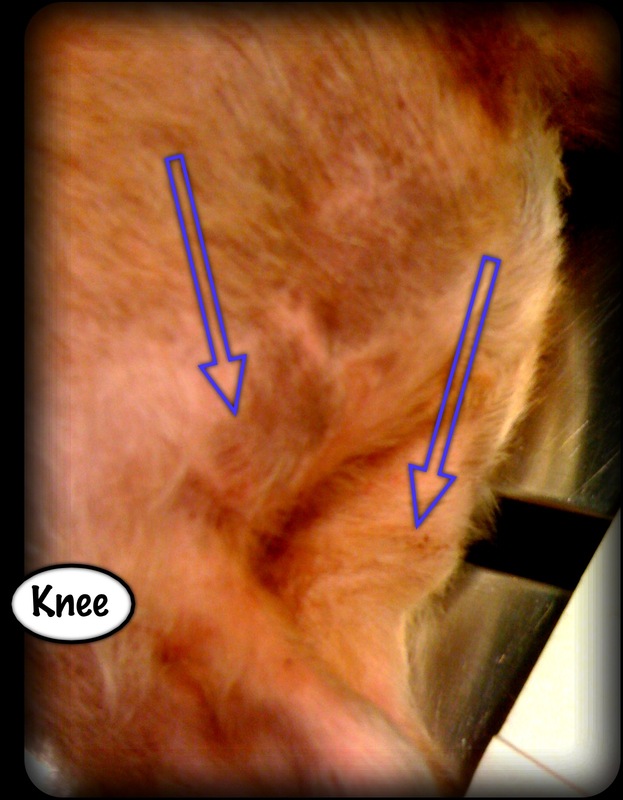 Well I hope he’s or she is ok. My dog has a hole on the back of his leg and a scratch above the hole. Barnum has developed hygromas on his elbows, one worse than the other. Sigh. It’s been a very hot summer, and he hates the heat and is preferring the cool tile of the bathroom to his dog bed. Should I open vitamin E capsules and smear it on the elbows? Anything else I can do (aside from trying to get him to forsake the tile floor for the dog bed)? I did put down a thin mat at the beginning of the summer so he’d have something to lie on when not in his bed/crate which allows him to see me better. I can’t put a dog bed in that space because I need an aisle for my wheelchair. Any other ideas? At least, thanks to having read this article at the time you posted it, I knew what we were dealing with and didn’t freak out that he had a cancerous lump or something. Oooo. That’s tough. With his refusing to lay on soft surfaces, you may have to pad his elbows/legs. The vit e can help heal ulcers or sore skin, but the hygroma itself is the body’s reaction to constant pressure. Perhaps you could leave his fur grow longer around the elbows as natural padding.